As members of the federal government and First Nations community met behind closed doors Friday, demonstrators marched in communities across Canada in support of the Idle No More movement, echoing calls from a hunger striking Ontario chief for indigenous sovereignty. As members of the federal government and First Nations community met behind closed doors today, demonstrators marched in communities across Canada in support of the Idle No More movement, echoing calls from a hunger striking Ontario chief for indigenous sovereignty. Hundreds of chanting demonstrators marched on a rainy Parliament Hill Friday afternoon, waving flags and briefly blocking the main entrance to the Prime Minister's Office. In rural Nova Scotia, more than a dozen members of the Millbrook First Nations set up wooden palettes and a car on railway tracks, delaying passenger and freight trains near the town of Truro. Via Rail said in an email that it took 53 passengers to Truro from Halifax by bus and that a train was scheduled to leave from that station for the rest of the journey to central Canada. CN spokesman Jim Feeny said the company was talking with aboriginal organizers over their plans to block trains in an effort to keep lines open. 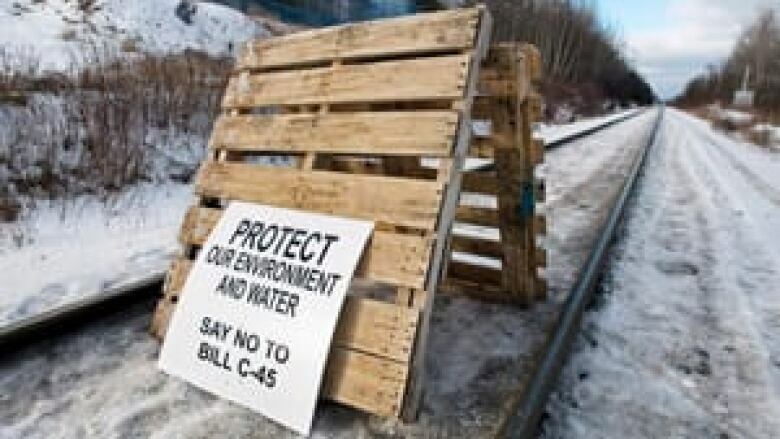 The nationwide demonstrations are attempting to bring more attention to changes to Bill C-45, the Conservative government's controversial omnibus budget bill that directly affects First Nations communities. 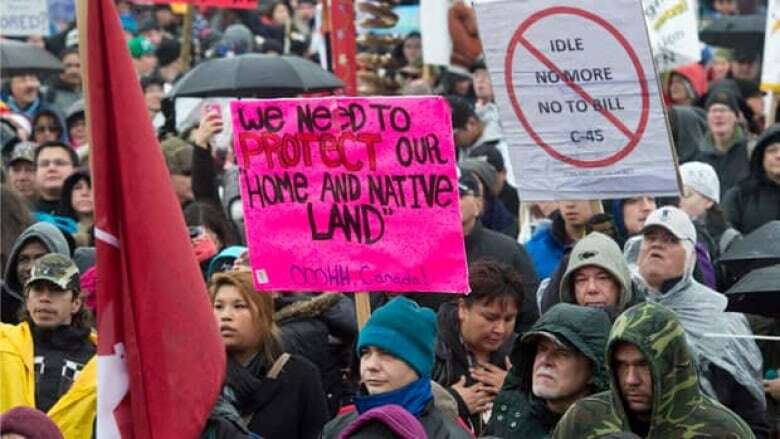 The Idle No More movement has said the bill erodes the rights of native people. First Nations leaders say there has been a lack of consultation on changes to environmental protection regulations. Attawapiskat Chief Theresa Spence, who has gone more than four weeks with only fish broth and medicinal tea, attended a Rideau Hall meeting Friday evening between First Nations chiefs and Gov. Gen. David Johnston, but vowed afterward to continue her hunger strike. She wants a meeting with both Prime Minister Stephen Harper and the Governor General present. Supporters of the movement protested in cities across Canada including Charlottetown, Winnipeg and Calgary. The largest crowds outside of Ottawa seemed to be in Montreal where about 1,000 people showed up for a protest near the Palais des Congrès, a convention centre downtown. In Edmonton, Chief Allan Adam of the Athabasca-Chipewyan First Nation joined a gathering of several hundred people, where he warned of imminent economic disruption if steps aren't taken to rescind the Conservative government's controversial omnibus legislation. "Highway 63 to the oilsands will be shut down. That will happen and I guarantee this," warned Adam, whose reserve is near the oilsands. "I fear for the worst if the prime minister doesn't retract some of the bills that were passed." In Toronto, a few hundred gathered in Toronto's Dundas Square, drumming and chanting. "It means our future," she said of the Idle No More movement. "It means what's going to happen. We're not standing idle no more. We're not going to stand around and just let things happen." In Halifax, 300 people reportedly gathered in a historic square near city hall. In Calgary, about 100 people attended two Idle No More protests, most at the University of Calgary and about two dozen more outside Harper's constituency office in southwest Calgary. A call for the repeal of Bill C-45 received cheers from demonstrators. Around 150 people came out to the University of Windsor's student centre in southern Ontario for a peaceful demonstration. Idle No More participants said they planned to target the Ambassador Bridge, the suspension bridge connecting Windsor and Detroit, Mich., next week but insisted it would be "an economic slowdown," not a blockade. About 200 people gathered in Charlottetown. And in Vancouver, a crowd of less than 100 met at the Native Education College to march the two kilometres to city hall. Protests were also organized for several Winnipeg locations, including the Manitoba legislature. Even as these protests unfolded, First Nations chiefs talked of major protests on Jan. 16 if their demands are not met. Grand Chief Gordon Peters told reporters that aboriginal protesters could block major roads and rail lines in Ontario on Wednesday. He also threatened to go to international investors and tell them their resource extraction projects are not safe if the government pushes through developments without consent from First Nations. Speaking on CBC News Network's Power & Politics on Friday, Grand Chief Derek Nepinak from the Assembly of Manitoba Chiefs called Friday's protests a "great victory" for First Nations people and Spence. "There is a great power that's emerging once again," he told host Hannah Thibedeau. "The warrior spirit of our people is once again across the land. It's very strong." He said the First Nations have always been peaceful and loving first, and that Canadians should remember that on Wednesday. "I encourage all Canadians, don't be inconvenienced by what you see when you travel on the lands and the territories of your homes," he said. "Don't be discouraged by it. In fact, I encourage everybody to join." Carl Balan, who is organizing the Idle No More protest at the University of Winnipeg, said the purpose is to educate people about how the new legislation could affect them. "We're not doing this because it's an Indian thing. It affects every single Canadian," he told CBC News. The Idle No More movement, which began in November and quickly spread across the country through rallies and social media, stemmed from discontent among First Nations people over the federal government's general stance on indigenous rights. On its Facebook page, the movement says it wants to "stop the Harper government from passing more laws and legislation that will further erode treaty and indigenous rights and the rights of all Canadians."